Numerous treatises were published in the 17th century, from Italy and Spain to France, England and the Netherlands. Many of them addressed the issue of studio practice, the artist’s materials, and the pigments were described in this context. Focusing especially on miniature painting and oil painting, 110 pigments are discussed in the extracts from the 10 treatises included in this little volume. And of general concern was the mixing of pigments to achieve a wider range of nuances, hence it was the century of the first colour charts. On them the pigments were named in several languages, providing a concordance of pigment names and an international palette. 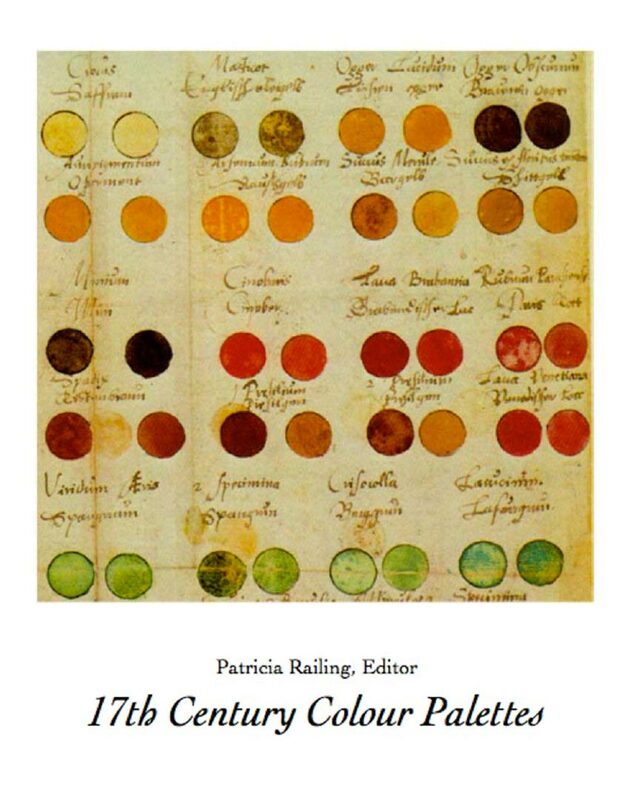 The Editor’s essay discusses the Painter’s Studio and the innovations in the mixing of pigment colours. English Treatises – No. 1. Henry Peacham, Gentleman, From The Art of Drawing with the Pen, and Limming in Water Colours, No. 2. Edward Norgate, From Miniatura, or the Art of Limning, 1627/1648.No. 3. Richard Waller, A Catalogue of Simple and Mixt Colours, 1686. An International Treatise – No. 4. Theodore Turquet de Mayerne, FromPainting, Sculpture, and of the Lesser Arts, 1620-1634. Spanish Treatises – No. 5. Vicente Carucho, From Dialogues on Painting, 1633. No. 6. Anonymous, From A Tract on the Art of Painting, c. 1656. An Italian Treatise – No. 7. Gian Batista Volpato, From The Mode to be Observed in Painting, late 17th century. Gutta Gamba, Gamboge ­– Natural, plant. Ochre de Luke or Luce – Natural. Ochre de rue, de rouse – Natural. Saffron orange – Artificial, plant. Brabant lake – Artificial, plant. Carmine – Pigment and colour name. Cinnabar – Natural. Crimson – Colour name. Dragon’s blood – Artificial, lake, plant. Florentine lake – Artificial, lake, animal. Indian lake or Indian lac – Artificial, lake, animal. Lakes – Fine and Common. Artificial. Ochre, Oker, Rubrica – Natural. Parisian red – Artificial, lake, plant. Red earth, ochre – Natural. Reddle or Ruddle – Natural. Rosette – Artificial, lake, plant and animal. Rouget – Artificial, lake, plant. Rubricks, Bloodstone, Haematite – Natural. Sandarac, Sandaraque as Realgar – Natural. Sandarac as Red Lead – Artificial. Sinaper Lake – Artificial, lake. Venetian lake – Artificial, lake, animal. Barilla green – Artificial, plant. Bice, bise, green – Natural. Bladder green – Artificial, lake, plant. Iris green – Artificial, plant. Sap green – Artificial, plant. Bice, bise blue – Natural. Flanders blue – Artificial, plant. Indico, indicoe, indigo – Artificial, plant. Litmos blue / litmus – Artificial, plant. Mountain blue / Montanum. Natural. Ultramarine from Cyprus – Natural. “Brusle”, Burnt yellow ochre – Natural, artificial. Florey blew – Artificial, plant. Orchal, orchil – Artificial, plant. Browne of Spaine – Natural, Artificial. From left to right: white lead, yellow ochre, vermilion, stil-de-grain, followed by browns and blacks. Yellow ochre is a natural iron oxide pigment. Umber is a native earth used both raw and burnt, the latter having a deep reddish tone. Terre verte or green earth is an iron silicate with clay. The principall end and subject of this Art, is to set out things both in proportion of parts, and liveliness of colour. For the former, the proportion of parts, I have given sufficient information for the meanest capacitie in the precedent part of this tractat: now therefore I will speake of the other, the colouring or setting out in colours. But first provide a frame or Easel called by Artists, which is very necessary to worke upon, especially greater pieces of worke: the forme whereof followeth. Also you must provide divers little shels to put your colours in, also pensils [brushes] of all sorts, both for priming and other: a light ruler of one foot and a halfe, or two foot long: and colours of all sorts ground very fine upon a porphire or marble. Having provided these, you shall set to worke, observing the subsequent directions. Colours are either simple or compounded, merely tinctures of vegetables, or substances of minerals, or both: the simple colours are such as of themselves, being tempered with the water or oyle, doe give a colour. The compounded are such, whose ingredients do exceed the number of one. Vegetables are rootes, juces, berries, and such like things as grow out of the earth. Minerals are such as are dig’d out of the earth, as earth, and stones, etc. All which follow in order, as well their preparations, as description. First note that every colour to be ground, ought first to be ground with the gall of a neat [ox]: then let them dry of themselves in a cold place, afterwards grinde them with gumme water for your use. Now I am come to the second thing observable (to wit) the mixture and laying the colours on the grounds, which is thus: your colours prepared for use, ought to be tempered according unto direction, still observing a meane: and to that end, mixe them by a little and little, till the colour please you; first you must lay on the ground colour, and let it dry throughly: then with a small pensill, pricke on the second colour, else it will be apt to run abroad, nor can you worke it so well, to make it seeme lively, as you may be pricking it on, especially in small peeces. If you are to paint over maps, or printed pictures that have writing in them, they use to lay on the thinnest colours, and alwaies before you lay any colours upon paper, wet the backe side of it with faire water, wherein store of Allum hath beene dissolved, and let it dry of it selfe; after wet it againe, and let it dry: doe it the third time, for this will strengthen the paper, that the colour shall not sinke through it, and moreover it will make the colour shew the brighter, and last, the better. Take cleane water, and put into it gum Arabicke a little, and let it stand untill the gumme be dissolved. Now you must have a care that it be neither too thicke, by reason of the Gumme, nor yet too thin: for with the one you cannot worke well, and the other will not binde the colour fast. Take two pound of Heidleber, two ounces of Allum, halfe an ounce of ashes of Copper, halfe a pound of water; put them into a Skillet, and let them boyle till a third be consumed: when it is cold, straine it into a cleane vessel, and let it stand a while, then straine it into another, and then let it stand till it be thicke enough. You must onely grinde blacke Lead with Gum water. Take good browne, and grinde it with Gumme water: his false colour is made with two parts browne, and a third part white lead, sad [shade, darken] it with the same browne. Take Umber or Spanish browne, grinde it, temper it with Gumme water. Take Verdigreese and grinde it first dry, and put unto it a little of the Gall of a neat [ox]; also of Saffron, and the juyce of Rew, of each a little: grinde them together, and put them into a shell, and let it dry there: when you would use it, grinde it againe with Vineger or Verjuce, and a lttle neat gall dissolved in either of them. His false colour is two parts greene, and a thirde ceruse: it must bee sadded with a good greene. First you must lay on a light blacke, mingled with white lead, and afterwards when it is dry, sad it with good blacke, for sad blacke, mixe Indie Baudias [indigo arrived from Baghdad trade route],with Gumme water. Take two parts of Indie Baudias and a third of ceruse and temper them with gumme water. Take Orpment, and Masticot, grinde each by themselves; but in grinding of the Masticot, adde a little Saffron, and worke with them. Note you may alay your Orpment with chalke, and sadde it with browne of Spain or Oker de Luke [perhaps “ochre de rue”, stream ochre or mountain ochre]. Take of white lead foure ounces, of Indicum [indigo] two ounces, put them into a leaden pot with vinegar: boyle them well, and that which swimmes on the top is the colour. This is a compounded colour, and it is made either by mixing a quantitie of Azure, and a portion of Turnsole: or else by mixing a quantitie of russet, and a quantitie of Azure. This colour is compounded of a bright red, and a bright yellow. First you must lay on a white colour tempered with gumme-water, and when it is drie you must go it over againe with Vermillion or lake, or else you must temper ceruse and vermilleon together, and being dry, go over it againe with lake or vermillion. This is compounded of Ceruse and Vermillion. This colour is compounded of vermilleon and azure. Take Saffron, or Cambugium, and temper it with gum-water, Sad it with Vermilleon. Burne harts-horne on a Colliers hearth; then grinde it with the gaul of a neat, put it into a shell, and let it dry in the shade: when you would use it, grinde it againe with gumme-water. Take a shell of gold, and put a little gum-water into it, and temper it together, and then you may write with it as with other colours. Take blew Turnsole, wet it in gum-water, and then wring it out, and mixe it either with Bise, or else over-shadow the Bise with it. Take Vermillion, and temper it with gumme water: His false colour is two parts vermillion, and a third part ceruse. Take russet, and temper it with gumme-water, slay it with ceruse, and sad it with it selfe. Take Brassill in grosse powder, allum in powder: steep them in gum water a night and a day: then straine it, and keepe it for use. Take Copper plates, put them in a copper pot, and put distilled vineger to them: set them in a warme place till the vinegar become blew, then put it out into another leaded pot, and poure more vinegar into it again, let it stand so till it become blew; this do so many times till you thinke you have enough: then let it stand till it be thicke. Take two handfuls of gauls, cut each gaul into three or foure peeces, poure into them a pint of beere or wine, then let it stand eight houres; straine it from the gauls, and put vitreoll therein, and to the vitreoll a third part of gumme, set it on the fire to warme; but let it not seeth, and it will be a good Inke, and of these gauls you may make Inke foure or five times more. Take an ounce of Brasill, twelves ounces of beere, wine, or vinegar, put it in a new pot, let it stand a night; and in the morning set it on the fire, and let it seethe till halfe be consumed; then put into it two peny worth of allum beaten together, and as much beaten gum-Arabicke: stirre them well together, and let them seethe againe; if you desire to have it somewhat darke, then scrape a little chalke into it when it seetheth: let it not seethe over the pot: when it is cold straine it through a cloth, and put it into a glasse well stopt. Take one ounce of Salarmoniack, one ounce of quicksilver [mercury] of countersein, halfe an ounce of brimstone [sulphur], bruise the brimstone, and set it on the fire, but let it not be over hot (lest it burne) then take the Salarmoniacke, and the quicksilver being in powder: mixe them well together, then mingle with them the brimstone: stirre them well, and quickly with a sticke till the brimstone become hard, then let it coole, grinde it on a stone, and put it in a glass well stopt with waxe, and set it in a pan with ashes; make a fire under it, and let it stand halfe a day in that manner (but not over hot) till a yellow smoke riseth on it, and when the yellow smoke is gone it is prepared. Here you must provide one thing more then you did before: that is, a Pallet (so called by Artists) whereupon you must put a small quantitie of every such colour you are to use, the forme whereof followeth. The colours to be used are altogether such dry substances as I mentioned formerly: as Oker, Vermilion red lead, Umber, Spanish browne, Lam-blacke, Gambugice, Masticot, Orpment, Ceruse, or Spanish white, blew and greene Bise, Verdigrease, and a multitude of such like, which may be had at the Rose in Cornehill, London. Your colours must be ground all very finely, and tempered with Linseed oyle; and to preserve them, put them in little earthen pans, and put water upon them, and cover them, that the dust come not at them: thus they may be kept a great while, and from thence you may take them as your use doth require. There are divers colours which without the admixture of another colour, will not be dry a great while; as Lake, Verdigrease, Lam-blacke: with such you must temper a little Umber or red lead. Divers Painters there are, that having haste of worke, doe use to temper their colour with one part of fatte oyle, and two of common Linseed oyle, and by this meanes they make the colours dry the sooner: this fat oyle is onely Linseed oyle exposed to the weather, and so it becomethe thicker: yea sometimes you shall see it so thicke, that you may cut it almost like Butter: it may bee made likewise by boyling of it a little while, but the former is the best. As for the tempering of your colours, I can prescribe no surer way then experience with diligent observation.